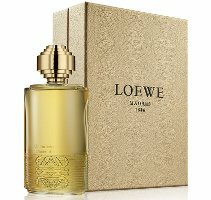 Spanish luxury brand Loewe has launched Colección Un Paseo por Madrid, a new quartet of fragrances "inspired by the splendour of Madrid...[and the] evocative, dreamy and majestic strolls that only the capital city can offer". El cielo sobre la Plaza de Oriente ~ named for the Plaza de Oriente on the east side of the Palacio Real; with notes of neroli, tangerine, ginger, jasmine, ylang ylang, orange blossom, olibanum, amber and cacao absolute. Atardecer en los Jardines del Buen Retiro ~ named for the Buen Retiro park; with notes of rose, bergamot, oud, sandalwood, patchouli, amber, tonka bean and cumin. Tras la tormenta en el Jardín Botánico ~ named for the Real Jardín Botánico de Madrid; with notes of saffron, rose, violet, sandalwood, patchouli, oud, musk and vetiver. The Loewe Un Paseo por Madrid fragrances are available in 100 ml Eau de Parfum, and can be found now at Harrods in the UK, £125 each. The note list for the first one just reminded me of that lovely fleurs d’chocolat trio Fresh had back around 2000. Loved the choc-pomegranate-earl grey tea one. I missed those Fresh scents entirely! Reminds me that it’s been a long time since they did anything new though. Tras la tormenta en el Jardín Botánico and Un balcón sobre el Paseo del Prado sound lovely! They do sound nice, and I like all the names. Still, not likely to try them, and they just did a “luxury” quartet last year — seems like a lot of fragrances. Indeed, it’s been a while since Citron de Vigne, which I was looking forward to greatly but didn’t like it at all. I wore Cucumber Baie for years, going back to when it was called Enact & the only place to buy it in the UK I believe was Liberty. The few I have tried were not to my taste, but I have not tried many. These Sound RADIANT! Loving On Them Already! What an interesting looking bottle.